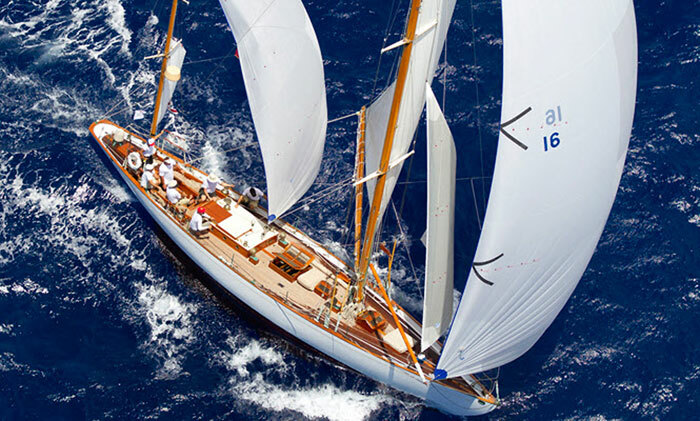 HONOLULU — Dorade, a 1929-built Sparkman & Stephens-designed 52-foot wooden yawl owned by Matt Brooks, was named first overall on corrected time in the 2013 Transpacific Yacht Race — better known as Transpac. Transpacific Yacht Club, organizer of the 47th biennial competition, reported that Dorade finished the 2,225-mile Point Fermin-to-Diamond Head race at 3:32 a.m. (Hawaii time) July 20 — with an elapsed time of 12 days, five hours, 23 minutes and 18 seconds. Dorade started the race July 8 (in the first of Transpac’s three staggered starts), its average speed over the course was 7.8 knots and the boat set a lifetime top speed record of 15.9 knots during the race. Tritium Racing/Lending Club, a 73-foot offshore trimaran owned by John Sangmeister, took first-to-finish honors in the Transpac Race, arriving at Diamond Head at 9:52 p.m. (Hawaii time) July 18. The crew finished the race in five days, 11 hours, 52 minutes and 33 seconds, elapsed time. The Tritium Racing/Lending Club crew reported that they faced several unexpected challenges along the course, including large amounts of debris left over from the tsunami in Japan in March 2011. According to a statement from Tritium Racing, delays and concern for safety prevented the crew from reaching their goal of breaking the race record set by Bruno Peyron in 1997 aboard Commodore Explorer, an 86-foot catamaran, in five days, nine hours, 18 minutes and 26 seconds. Tritium Racing/Lending Club started the race July 13, in the third of three staggered starts for the event’s 58 competing boats. The race’s second staggered start was on July 11. Transpac’s first race was in 1906 and took 12 days to complete — and the biennial event has since become one of the world’s premier sailing races. The nine-member crew included John Sangmeister, skipper; Renaud Laplanche, CEO at Lending Club; Ryan Breymaier, captain; Gino Morrelli, watch captain; Will Oxley, navigator; Peter Stoneberg, main trimmer; along with Howard Hamlin, Jay Steinbeck and Erik Berzins. Dorade’s crew included Brooks; Matt Wachowicz, navigator; Kevin Miller, tactician; Ben Galloway, watch captain; Eric Galloway, bow; Hannah Jenner, helm; and John Hayes, sail trimmer. This is the second Transpac victory for Dorade. The boat’s first Transpac win was in 1936. Roy Pat Disney’s Andrews 70 Pyewacket finished second overall on corrected time — two hours, 30 minutes and 26 seconds behind Dorade — using handicap ratings calculated in the ORR rating system on the Transpac wind matrix model. Pyewacket led from start to finish in the competitive Class 3, filled with “sleds” — ultralight displacement boats (ULDBs) — the likes of which dominated Transpac competition throughout the 1980s and 1990s. Per Peterson’s Andrews 68 Alchemy finished third overall on corrected time.